What a great idea! And you’ve posted so many choices, too. I love them! Thanks for sharing. So cute….I have bought a few for my daughter and thought about making some myself seeing how easy they are I am now going to have to try. Always wanted to know how to make these thank you for sharing this tutorial with us! What a cute idea, and super easy too! Thank you. I came by way of One Pretty Thing. Those are so adorable! Your choices of ribbon are so cute. And I love the buttons! Thanks for sharing! You make those cute hair clips look so easy! I’ll definitely be trying this out soon. Thanks so much for the clear directions. The photos make it all so easy for visual learners like me!!!!! Here come some Christmas stocking gifts for the girls in my family!!! What a cute idea, I’m cutting my hair soon (donating to Locks of Love) and I’m sure I will need clips as it grows out again. I’ve always wondered how these bows were made! Thanks for example! Facile, pas cher, beau..que demander de plus ? Merci pour cette belle idées! i tried bostock fabric glue..but it doesnt stick. am i doing something wrong or is that glue just a lousy glue? Thanks for the great tutuorial. I use a glue gun and love it. Also…a trade secret is to add a thin strip of adhesive velcro (the pokey side) to the inside center of the clip. This makes it NOT slip out of fine hair! Can you tell me where to purchase mini alligator clips? I am looking for the smaller size for babies. Smaller than the standard 1.75″. Please direct me to the tutorial for making baby hair clips. I cn not find it. I keep getting directed to the comment mage. 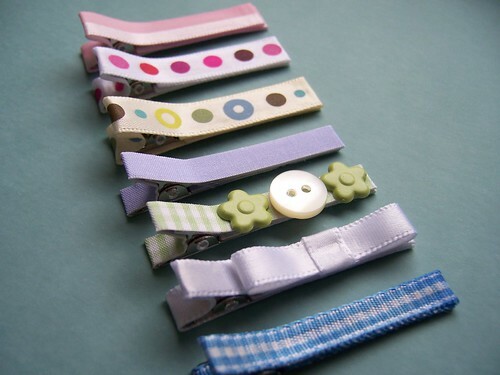 These barrettes are SO cute! I’ve featured them on my site today, and you can grab an “I’ve been featured” badge if you’d like.